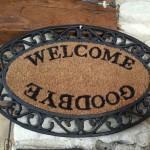 This doormat would be ideal if it was rotating…at the flick of a switch from inside your abode. Imagine you see two of those pesky,’we have come to save you’ duos on the other side of your door. 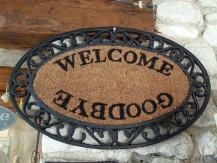 Wouldn’t it be great to whizz the doormat around from Welcome to Goodbye. I think I just invented something!